This is the first of a 32-part series in which I reminisce about each of the teams participating in the World Cup. Some teams I have little experience with but will include a few caveats most aren't familiar with. I start with the hosts of next year's tournament: South Africa. South Africa was marred for most of the century by its Apartheid system. What was used to segregate people induced a self-segregation and isolation of the country from world soccer. 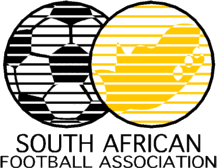 At one point, there were three different federations within the country: The all-white Football Association of South Africa (FASA), was formed in 1892, while the South African Indian Football Association (SAIFA), the South African Bantu Football Association (SABFA) and the South African Coloured Football Association (SACFA) were founded in 1903, 1933 and 1936 respectively (source: wikipedia). In 1992, they returned to the world stage once Apartheid was lifted and participated in the African Cup of Nations as well as the FIFA World Cup. My first memory of the South African team stems from its first game in the 1998 World Cup against hosts France. France was always one of my favorite teams ever since 1986, when they ousted Brazil through penalty kicks in the quarterfinal. I was happy to see the French back in the tournament and also newcomer South Africa. By this World Cup, the team total had been raised from 24 to 32, thus opening the way for more teams from less-represented confederations (i.e. CAF, AFC, CONCACAF). Most of us were content with France's 3-0 win over lowly, entry-level South Africa. I remember this game because I was watching it from my grandmother's store whilst on my way to get some paperwork done (visas and such). On that day it was Dugarry that started the game for France. Little did we know that soon Trezeguet and Henry would become France's dynamic duo. South Africa shared that group with Saudi Arabia (2-2 tie) and Denmark (1-1 tie). 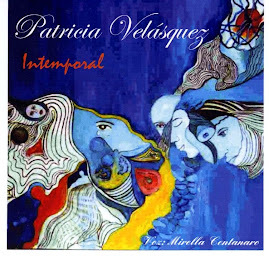 On to 2002. 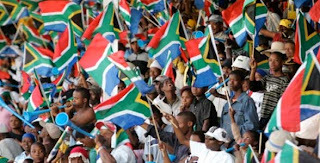 South Africa was now a soccer nation with aspirations to host a World Cup and one tournament under its belt. They were pitted into a "group of death" of sorts alongside Paraguay and Slovenia. Spain was the headliner and didn't disappoint. This tournament actually came down to who had scored more goals. South Africa tied Paraguay 2-2 and beat Slovenia 1-0. They lost to Spain 3-2... just enough to give Paraguay a berth having gone 0 goal differential but with a margin of 6 goals for and 6 against. South Africa had 5-5. I caught only highlights of that game, but I remember Jose Luis Chilavert (the emblematic Paraguay goalkeeper) saying that he was thanking his "Spanish brothers" for handing them the result. 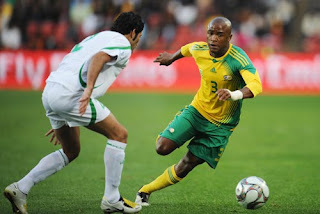 South Africa has had few stars in recent years, except for Benni McCarthy. The Blackburn Rovers man is 32 and has scored on 32 out of 77 competitive games for his country. Added to him are Portsmouth's Makoena (captain of South Africa) and Everton's Pienaar. The majority of the current squad play at home in the local league...something that might hamper their chances come next summer. Still, they face Mexico, Uruguay and France. They are at home and given their play in the Confederations Cup, they can hold their ground against any team. Just finished Gold, Diamonds, and War an excellent history of late 19th, early 20th century South Africa. You find yourself rooting for the doomed blacks against the British and Dutch, who both consistently behave like jack asses.